Plough mixer is widely used to mix powder, granule, and small liquid additives in food, chemical, and construction line. Plough Shear Mixer has different name in different area. In America, people call it as plow mixer, In Europe, people like to call Ploughshare mixer. For processing snacks products, a ploughshare mixer demonstrates that complex coating tasks can be implemented by comparatively cost-effective solutions with precise control of the process parameters. 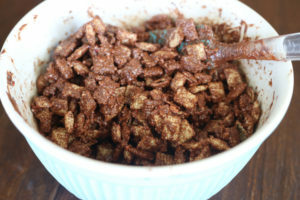 In practical terms this means coating extruded cereal products with chocolate and glaze. The ploughshare has a cylindrical shell with plough shovel welded or bolted on arms and the shaft runs at high speed to affect a fluidizing action. Plough Shear Mixer is designed for heavy duty blending of both dry and wet materials. Plough shape shovels mounted on a central shaft with its pointed ends are easily penetrable through the dense powder, party mass. The over lapping of shovels coupled with its shape and the high speed of the ploughs produces good mixing action and high turbulence. The snacks to be coated has a more or less round shape and a porous surface. 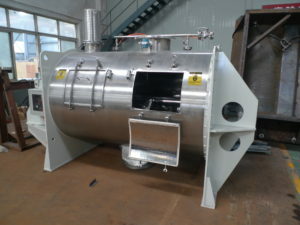 The particle size varies depending on the type. Likewise depending on the variety, up to 10 times the amount of liquid chocolate and/or glaze is applied. The crunchy properties of the snacks must be maintained. The use of high speed choppers further reduces the agglomerates of coated snacks, such as chocolate coated peanuts snacks. The chopper could be an option for customer if there has requirement of maintaining the size of snacks. Vortex’s ploughshare mixer is particularly good at handling in coating the dry solid with high viscosity liquid food additives. The powerful blending efficiency will guarantee the customer’s high requirement of coated products.